The first thing to remember about driving around in a hybrid or electric car in Kathmandu’s sidewalk-less streets is that pedestrians don’t hear you coming. The second thing is to pat yourself on the back for not pumping about six tons of carbon a year into the atmosphere that you would have if you’d been driving around in a full-fossil car. But if you are the type that doesn’t care about your carbon footprint, or likes the big roar of a powerful engine and a heavy car that sits solidly on the road, then hybrids are not for you. It’s also not for you if you are price-conscious because hybrids are up to twice as expensive as a similar-capacity car by the same manufacturer. And if looks matter to you, then the inexplicably ugly hind quarters of both cars may be a turn-off. Last week we took out the two hybrids now available in Kathmandu, the Honda Insight and the Toyota Prius, on a test spin around Kathmandu’s dusty and not-yet-widened streets. Both offer quiet, comfortable rides, with the added feel-good bonus. Comparing the Insight and the Prius is like comparing apples and orangutans. The two may be hybrids with motor-assisted charging, but are vastly different in size, fuel efficiency, controls and, of course, price. The Insight sample vehicle we drove was a 2009 model which is why the dashboard and upholstery looked a bit dated, but newer models have more contemporary design elements. It already had the colour-coded instrument panel that reminds you of a Dreamliner cabin: glows green when you are driving efficiently and turns to blue when you are guzzling gas. Although the temperature outside was 31 Celsius, the aircon cooled the cabin quickly with a self-confident blower even when idling on battery mode. The insulation and the UV-coated windows retain the cool and reduce the greenhouse effect. As with many of us used to stick shift, my left leg kept doing a kneejerk search for the clutch pedal. You can drive the Insight on ‘Eco’ mode or ‘Sports’ mode depending on whether you are eco-conscious or eco-reckless. The car automatically goes into Sports mode if you take off like a rocket when the light turns green, or resort to make-or-brake overtaking on the Hatiban uphill. Needless to say, it makes little difference to Planet Earth if you drive the Insight in Sports mode, or you drive a 1.6 litre petrol Civic. The engine turns off by itself when you brake at the light and restarts when you press the accelerator. Depending on whether your a/c is working the Insight’s brain decides when it needs extra power from the 98 horsepower engine and works on full battery mode when it doesn’t need the engine to kick in. You get a slightly Orwellian sense because the Insight’s computer brain is always watching your driving style and tells you where you could improve. It even gives you green medals if you accelerate smoothly and brake gently. From the Honda showroom we drove in our trusted electric Reva-i across town to the Toyota office to try out the Prius and were immediately struck by its dimensions. Compared to the Reva, the inside is humongous, even bigger than the Insight. The second-generation Prius which we test-drove had more oomph than the Insight. 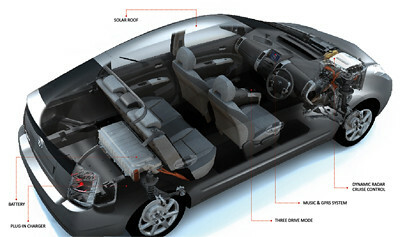 The 1.6 litre engine is part of the reason, but the battery also packs more energy. For such a big car the Prius is, if you pardon the sexism, almost effeminate in look and feel. The gear knob is like a mouse and the curvaceous dashboard and instrument panel remind one of an all-glass cockpit. The Prius was more comfortable and quieter even though its engine was 130 horsepower. The hatch is so big you can pack in four big suitcases and still have space to spare. With the automatic everything, you soon get the feeling that the new Prius is designed like a fly-by-wire Gulfstream III. This is a car whose motto is: ‘I think therefore I am’. And it shows you what it is thinking through digital IP graphics constantly updating you on what is powering your car at any particular moment. This can be a bit distracting for first-timers like me because you are taking your eyes off the road to admire yourself for being such a green driver. The car seems to have a mind of its own and moodily shuts off the engine on an uphill, but keeps the speed with battery power. “What happened there,” you ask. But the Prius doesn’t reply and just climbs silently on. The great thing about the Prius is that the engine shuts off when the car is doing less than 40 kmph, which is most of the time in Kathmandu’s traffic. The Prius has a low clearance, which can be a problem at Naubise on the drive to Pokhara but it glided over the Ring Road potholes without an ouch. Toyota may want to import the smaller Prius C four-door hatchback compact to Nepal since it will be less pricey and better suited to Kathmandu streets. The Prius we drove had the dimensions of a SUV, so it’s a good thing they’ve widened the Lajimpat road. 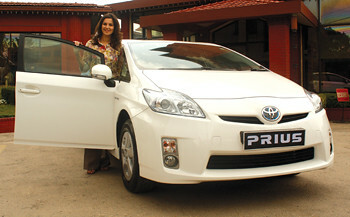 But with the current price tag of Rs 13 million, duty-unfree Nepalis may not be too interested in greenwashing themselves despite Toyota’s slogan for the Prius: ‘Luxury with responsibility’. 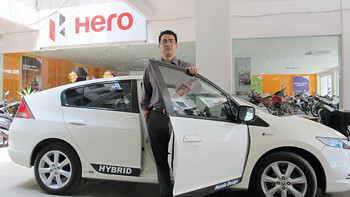 Kunda Dixit has been called the ‘electric editor’ for his efforts to promote non-fossil vehicles in Nepal. The new Reva e20 has not made the kind of impact in India that many expected and with the roll down of petrol prices last week, there will be even less of an incentive there to go for the stylish remake of this electric pioneer. The e2O is not ‘20’, the ‘e’ stands for electric and the ‘O’ for oxygen and its pick up has been sluggish mainly because of the price tag in India of INR 600,000 which means with our taxes and markup it can be anywhere up to Rs 2 million when it arrives in Nepal. Given the brand value and hassle-free experience of present Reva drivers, however, many would be tempted to upgrade. Compared to the old Reva, the new model looks less like an insect, is roomier inside, and has more safety features. The bonnet has the spare wheel laid horizontally instead of protruding from the bottom. 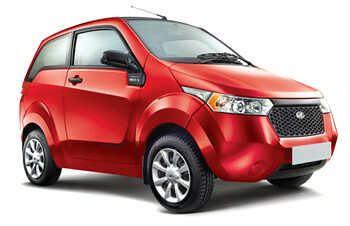 The grill, which gives the e2O the nerdy look of a regular car is actually the a/c and intake for battery and motor cooling. Mahindra, which bought Reva from its previous owner in 2011, is hoping for a big export market to build on the 6,000 or so units sold in Europe. 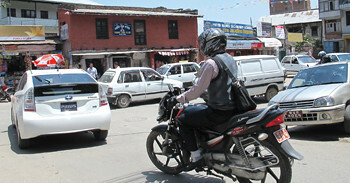 There are about 80 old models in Kathmandu, where owners are mostly happy with its performance. Mahindra has also made the interior spiffier, without the golf cart look of its predecessor. The dashboard is all digital and has Prius-style LEDs to show power flows and charge levels. The biggest difference is in propulsion and performance. The lithium ion batteries under the front seat give the car a much improved mileage of 100km (85km with a/c) and a shorter charging time of five hours in a standard 15 amp socket. The e2O is also a phone, believe it or not, and will be transmitting its performance to your local dealer. Big Brother is watching how much juice you have left in your battery. There was a time when owning an electric car in Kathmandu was a statement. Now it is a necessity. Despite the price tag for the new Reva, the savings in fuel costs and even more on time saved not waiting in line for it, would still make the new model a worthwhile proposition. If your electric car is too small for the family and a hybrid is way beyond your reach, the Chinese-made Baoya may just be the petrol-free vehicle for you. Built on a Malaysian Naza chassis with US-made electronics and Chinese batteries, this electric car looks no different than any other compact on Kathmandu’s streets. What the Baoya lacks in looks it more than makes up for in performance and seems to have outgrown the slightly sloppy image of its earlier experimental models that were unreliable and had shoddy finishing. Baoya also makes electric vans and is sold in Nepal by NEVI. 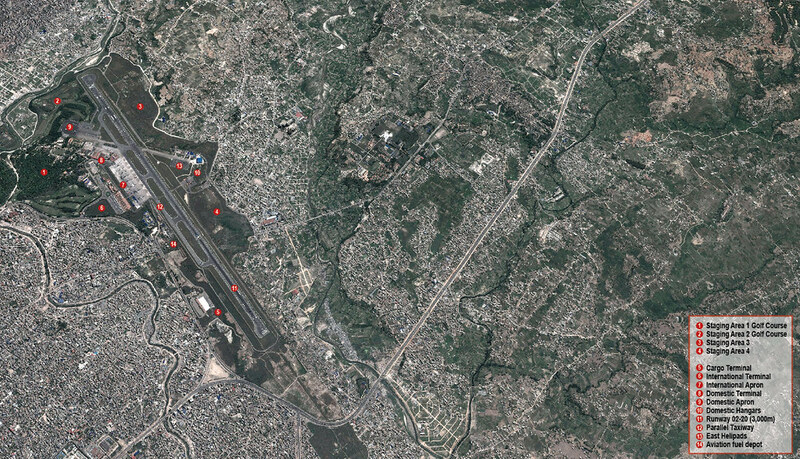 Nearly 9,000 cars, SUVs, and jeeps are sold in Nepal every year. The country spends Rs 75 billion a year importing diesel and petrol from India. Cutting petrol and diesel consumption by improving vehicle efficiency by just 10 per cent would save the country Rs 7.5 billion a year. The best way to do that would be to provide tax incentives for electric and hybrid vehicles. But except for an excise rebate for pure electric vehicles, successive governments have been reluctant to give up the lucrative source of revenue from a whopping 240 per cent in taxes on cars. 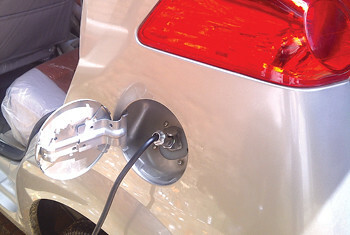 Now that there are technocrats running the government, the Nepal Automobile Dealer’s Association (NADA) is giving it one more try to convince officials that the country (and the planet) will benefit from reducing petroleum consumption by encouraging electric and hybrid vehicles. NADA is lobbying to cut the customs duty from the present 80 per cent to 20 and remove the excise and road tax in accordance to the policy on electrics. This would make the Insight and the Prius more comparable pricewise to similar size petrol sedans.